Route: http://www.mapmyride.com/routes/fullscreen/326646145/ – Tri County Ride, the same as last year’s route (Hidalgo, Cameron, and Willacy Counties). **NEW **Support and Gear (SAG): SAG will only be available until 5pm. Please make personal arrangements if you wish to continue and complete the 100 mile ride. This ride is for experienced riders who have been training to attempt and complete 100 miles. This ride is not for children. All minors under the age of 18 should be accompanied by their parents or guardians at all times. You can pick up your Bib number starting at 6:30am. 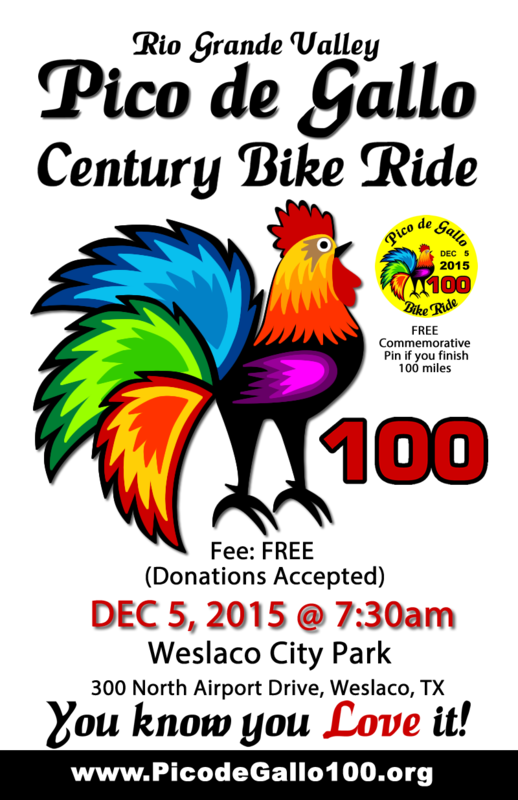 Be ready to sign event waiver in order to receive your Pico de Gallo 100 Bib Number. Pictures will be posted on our Facebook page. If you post your own pictures, please use #picodegallo100 and link back to our page. This entry was posted in Ride by Irma. Bookmark the permalink. What date for picodegallo2016 ?